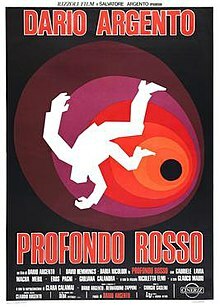 Deep Red (original title Profondo rosso; also known as The Hatchet Murders) is a 1975 Italian giallo film, directed by Dario Argento and co-written by Argento and Bernardino Zapponi. It was released on 7 March 1975. It was produced by Claudio and Salvatore Argento, and the film's score was composed and performed by Goblin. It stars Macha Meril as a medium and David Hemmings as a pianist who investigates a series of murders performed by a mysterious figure wearing black leather gloves. Argento later opened a retail movie memorabilia store in Rome called Profondo rosso, operated for years by his long-time associate Luigi Cozzi.Two shadowy figures struggle until one of them is stabbed to death while a child's scream is heard.In the city of Rome, psychic medium Helga Ulmann (Macha MÃ©ril) holds a lecture in a theater where she senses that there's someone with a twisted and violent mind in the audience that she cannot clearly identify. Later that night, while Ulmann is in her apartment taking notes about the incident in the theater, someone kicks the door in and murders her with a meat cleaver, also destroying her notes in the process. Musician Marcus Daly (David Hemmings), who lives in the same apartment building, is walking home when he sees her being attacked through the window. Rushing inside to help, he's too late as Helga bleeds to death.